Acrylic Cones and Pyramids in various sizes and angles – with diameters ranging from 8″ to 40″. Cones can be used for torchieres, pendants, wall sconces (Half-cones), or for architectural street lights. 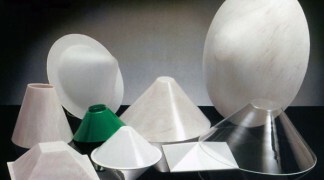 Truncated cones come in a wide variety of designs and sizes. Truncated pyramids are molded without seams and are available in many diverse angles, heights and base dimensions. Hexagonal and octagonal shapes are also available.